Did you notice? 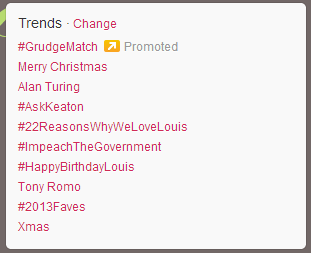 The hashtag #ImpeachTheGovernment trended on Twitter last night. Competing with the phrase “Merry Christmas,” the meme was the 5th most popular organic hashtag on December 23, 2013 as of 7:20 PM PST. Responding to a call for action by TheAnti-Media.org, Twitter users posted reasons why the U.S. Government should be impeached, with the goal of starting a public dialog and shedding light on the government's crimes against humanity. Tweets included mentions of #NSASpying, #NDAA, #GITMO, drone strikes, #KillLists and other "high crimes" against the people under Article II, Section. 4 of the U.S. Constitution. The NSA spying scandal references how the U.S. government misled the Supreme Court on warrantless wiretapping. The National Defense Authorization Act (NDAA), Sections 1021 and 1022, authorizes the indefinite military detention, without charge or trial, of any person, including an American citizen. By applying the "Law of War" to U.S. soil, the recently renewed 2012 NDAA makes the United States legally a battlefield. Mentions of #GITMO refer to the torture and indefinite detention of military prisoners at Guantanamo Bay detention camp since January 2002. Despite campaign promises, President Obama has not shut down the detention facility. President Obama authorizes murder of designated "terrorists" (and their families) via drone strikes. The secret "Kill List" is a moral and legal conundrum for the United States.